Purely foodie post, but the recipe is also healthy :) I wanted to make two-ingredient pancakes originally, but only had frozen bananas. 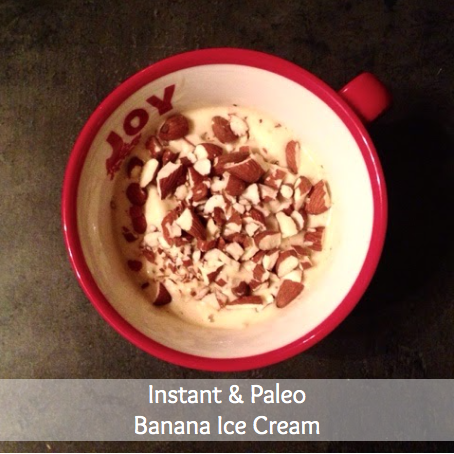 As a result I got delicious banana ice cream (100 % paleo) instead of the intended pancake batter. Put banana(s) and egg(s) in powerful blender and blend until smooth. Add any topping of your choice (cut up nuts, pieces of dark chocolate, fruits, dried fruits...). Serve and eat immediately - enjoy! TIP: I usually have frozen bananas in my freezer in resealable ziplock bag. Sometimes when I buy them in bulk because they are on sale and I do not manage to eat them. Before they would go bad, I peel them and cut in half and put in the ziplock in the freezer. They are delicious for smoothies and as turned out for "instant ice cream". NOTICE on raw eggs: I don't mind to eat raw eggs, when I know they are fresh and from credible source. I like that they add little protein and fat to this recipe. You could also use coconut cream for example or any nut milk.